The obesity epidemic: too much food for thought? Traditional treatment strategies and public health interventions aimed at reducing the incidence of obesity are proving inadequate at controlling the global epidemic of this condition. The main focus of any intervention should be on preventing small excesses of weight, which lead to large weight gain over time, as once a large amount of excess weight is gained, it is very difficult to lose. The only effective approach is for governments to implement radical policy change, to regulate food consumption and control the food industry in a similar way to that of the tobacco industry, by banning the advertising of selected produce, taxing certain foods, and rationing the purchase of others. Obesity has reached epidemic proportions in the United States and is threatening to become a global epidemic. The 1980s and 1990s witnessed alarming increases in obesity across the globe.1 In Britain between 1980 and 1991, the prevalence of obesity doubled and is continuing to increase.2 In England alone, 30 000 deaths occur a year, and £500 million (about 700 €) per annum is spent in treatment by the NHS.3 Childhood obesity has also risen dramatically over the last 20 years.4 As with adults, obesity in childhood causes hyperinsulinaemia, hypertension, dislipidaemia, and increased endothelial dysfunction.5,6 The “insulin resistance syndrome” has been identified in children as young as 5,7 and type 2 diabetes, once virtually non-existent in adolescence, now accounts for almost half of all new diagnoses of diabetes in North American children.8 This is ominous considering the macrovascular (heart disease, stroke) and microvascular (blindness, kidney failure, neurological complications) sequelae of type 2 diabetes. Obesity is very difficult to treat, and maintenance of “normal” weight once excess is lost is almost impossible in the long term. A meta-analysis of 29 studies that examined five year weight loss maintenance reported that obese individuals maintained weight loss of only 3 kg (representing a reduced rate of 3% below initial body weight) over this period.9 The success rate of weight loss interventions is low, therefore policies and interventions that focus on the prevention of obesity are needed. Possible policy and control strategies are outlined below and some recommendations are discussed. This article is selective and is intended to inspire thought and debate rather than draw definitive conclusions. Battle and Brownell10 wrote, “it is hard to envision an environment more effective than ours [USA] for producing obesity”. Increases in obesity are related to a wide variety of environmental factors that encourage a positive energy balance. In an environment in which food availability is unlimited, weight maintenance is accomplished primarily by the regulation of food intake. Obesity can be viewed therefore as a physiological adaptation to our environment. Apart from a relatively small number of people with specific metabolic disorders, the fundamental cause of obesity is consuming too much food for the level of physical activity—that is, energy intake exceeds overall energy expenditure. For example, a positive energy balance of only 500 kJ (120 kcal) a day—that is, one small chocolate bar—would produce a 50 kg increase in body mass over a period of 10 years. Any factor that increases energy intake and/or decreases energy expenditure, even by a small amount each day, will result in weight gain and possibly obesity in the long term. Policies on food production, advertising, promotion, pricing, and the availability of high fat “fast food” or high sugar foods are factors that have helped contribute to the increase in obesity. Changes in the Common Agricultural Policy in Britain over the last 50 years have resulted in intensifying farming methods in order to provide an abundance of cheap food for the masses. The greater affordability of food has also contributed to excess energy consumption. Today, a wide variety of relatively inexpensive, highly palatable foods are available almost everywhere. We no longer have to spend most of our day hunting and gathering food as our ancestors once did; instead we can drive to the local corner take away, fast food outlet, or supermarket. A recent report (March 2003) commissioned by the World Health Organisation and Food and Agriculture Organisation stated that many deaths attributed to chronic diseases are caused by obesity and low levels of physical activity, which can be prevented by restricting consumption of “energy dense” foods and “sugar sweetened soft drinks”.15 Their report criticises the food industry for aggressively marketing energy dense, micronutrient poor foods. The report recommends that such marketing should be restricted, but fails to specify who should do this or how. Concomitant with these changes in food production and marketing is an insidious reduction in occupationally related physical activity. Many manual tasks have been replaced by automated machines and labour saving devices. Most occupations these days are sedentary16 (fig 1). Low levels of physical activity are associated with an increased risk of obesity and other chronic diseases.17 Walking is no longer our main mode of transport and has been replaced by the motor car. This has been an important influence in lowering physical activity levels across all sectors of the population. Increased use of motor cars and urbanisation has resulted in the decline of bicycle use, as cycling (and walking) in many inner city areas and roads is unsafe. 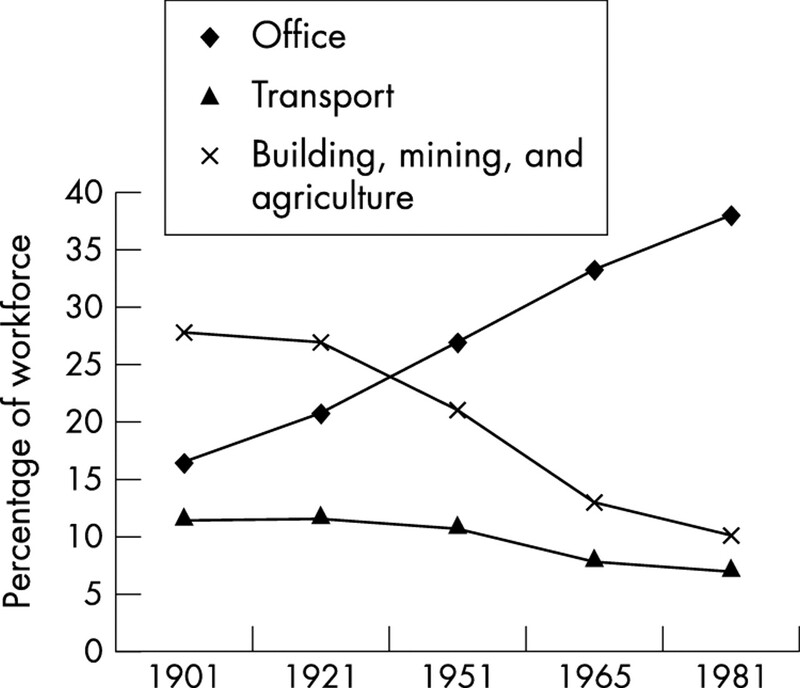 Percentage of the workforce by occupational activity. The Health Survey for England (1998) showed that 70–80% of the adults in Britain lead sedentary lives,18 and it is likely that the trend to more and more sedentary lives will continue. Lower levels of physical activity are associated with lower daily energy requirements and will cause overweight and obesity unless food intake is adjusted accordingly. A typical fast food cheeseburger, chips, sugary drink, and dessert contains about 2200 kcal (9200 kJ),19 which at about 85 kcal per mile would require a person to complete a distance of about 26 miles (marathon) to expend the energy consumed. Bearing in mind that most of the British population do not even walk the equivalent of 1 “brisk” mile a day, it is hardly surprising that, as a nation, we are getting fatter. It is highly unlikely that we will be successful in reversing a sedentary lifestyle solely by encouraging people to become more physically active—there are too many barriers (television, electronic computer games, and technological advances). Nor is it likely that interventions for behavioural change in eating patterns will be successful, as the human physiological and psychological mechanisms to defend against body weight gain when food is so abundant are weak. Several other authors have suggested strategies to prevent obesity, but none have opted for radical policy change.20–22 To tackle the fundamental problem of positive energy balance, there needs to be radical changes in our society and the environment in which we live that enforce and empower people to change their eating behaviour. A summary of recommendations is listed in table 1 and are discussed below. It has been suggested that social norms relating to use of transport (mainly motor cars) can be challenged in a similar way in which attitudes to smoking have changed over the past 50 years. Mindell23 stated that valuable lessons may be learnt from tobacco control activities. There is also no reason why these principles cannot be applied to the regulation and control of food consumption. Taxing the production of “snack foods” and unhealthy foodstuffs is a low cost strategy with potential to reduce consumption in low socioeconomic groups, where obesity is most prevalent.24 Taxes levied on selected energy dense foods could then be used to subsidise other healthier produce such as fruit and vegetables. The relative success and reaction of the tobacco industry to control strategies may serve as a litmus test for the potential effectiveness of such an intervention. Over 100 nations now restrict tobacco advertising to some degree,25 and some have introduced all but total bans on tobacco advertising (New Zealand, Britain, and Canada). Smoking in public places has now been banned in New York City, USA. The advances in tobacco control over the last few decades have been instrumental in the way smoking is accepted socially. Legal actions against the tobacco industry have helped to break down their hitherto impenetrable wall of defence. There is no reason why this could not be so for the food industry if there is political will and financial commitment. Although many might recoil at the idea of food taxation and control, the tobacco precedents show that public opposition can, in time, be successfully overcome. Junk food may not be addictive in the same way that tobacco is, but weight, once gained, is very difficult to lose long term. Once an obese youngster develops diabetes, he/she will never get completely rid of the disease—which, one could argue is a lot more irreversible than smoking addiction. During the second world war (1939–1945), the British government introduced food rationing with a “point” system in every household. Each person was allocated a number of points a month and certain food items, such as meat, fish, biscuits, sugar, fats, and tea, were rationed.26 Every adult was given a total of 16 points a month and could choose how to spend these points. Special supplements were made available for young children, pregnant women, and people with certain diseases. The wartime food shortages and government directives forced people to adopt different eating patterns; people ate considerably less meat, eggs, and sugar than they do today27 (table 2). The quantities available during the war would appear meagre by today’s standards of consumption, yet very few civilians during the war years were malnourished.28 In July 1940 a complete ban was put on the making or selling of iced cakes, and rationing of sweets began on 26 July 1942. Rationing was enforced in Britain for 14 years, and continued after the war had ended, when meat was finally derationed in June 1954. Petrol was also rationed, so people stopped using and buying cars, and public transport was limited. Interestingly, during the years when rationing was enforced, the prevalence of obesity was negligible in the United Kingdom. Although there are no body mass index values for this period, average height and weight statistics are available (although limited).17 Figure 2 gives an indication of how the prevalence of obesity has risen since the 1950s. 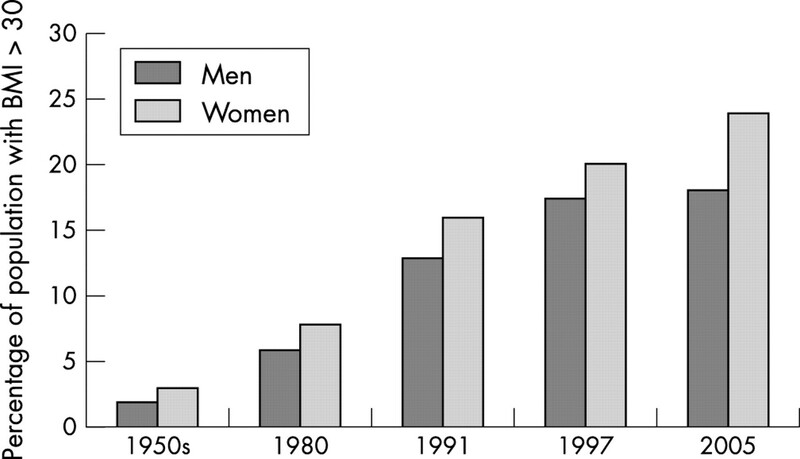 Changes in the prevalence of obesity. BMI, Body mass index (kg/m2). It is not inconceivable that some form of food rationing and portion size control may be required in the future if the dramatic rise in obesity continues. This could be achieved through the supermarkets, as most of the food that we consume in the home is purchased at a relatively small number of food outlets. All of the big supermarkets produce an item by item breakdown of goods purchased on the till receipt. It is possible in theory to estimate most of one’s average food consumption each month. Obesity is virtually impossible to treat by conventional methods, therefore efforts need to be directed towards prevention. To change social attitudes and challenge social norms, governments must implement radical policy changes that enforce an environment in which food production, marketing, and consumption are controlled. Lifestyle decisions are made by individuals, but the environment in which they function needs to help support behaviour change. We have had successful policies and environmental action to provide (nearly) smoke-free cleaner air, cleaner water, and public sanitation systems. Now it is time for us to have policies and actions that provide us with a healthier environment for food consumption and prevent the insidious daily food excess that leads to overweight and obesity. World Health Organisation. Obesity: preventing and managing the global epidemic. Geneva: WHO, 1997:894. Laitinen J. Obesity is a health problem. Int J Circumpolar Health1998;57:104–8. National Audit Office. Tackling obesity in England: executive summary and recommendations. London: Stationery Office, 2001. Ebbeling CB, Pawlak DB, Ludwig DS. Childhood obesity: public-health crisis, common sense cure. Lancet2002;360:437–82. Freedman DS, Dietz WH, Srinivasan SR, et al. The relation of overweight to cardiovascular risk factors among children and adolescents: the Bolalusa Heart Study. Pediatrics 1999;103:1175–82. Tounian P, Aggoun Y, Dubern B. Presence of increased stiffness of the common carotid artery and endothelial dysfunction in severely obese children: a prospective study. Lancet2001;358:1400–4. Young-Hyman D, Schulundt DG, Herman L, et al. Evaluation of the insulin resistance syndrome in 5–10 year old overweight/obese African-American children. Diabetes Care 2001;24:1359–64. Fagot-Campagna A, Pettitt DJ, Engelgau MM. Type 2 diabetes among North American children and adolescence: an epidemiological review and public health perspective. J Pediatr2000;136:664–72. Anderson JW, Konz EC, Frederich RC, et al. Long-term weight-loss maintenance: a meta-analysis of US studies. Am J Clin Nutr 2001;74:579–84. Battle EK, Brownell KD. Confronting a rising tide of eating disorders and obesity: treatment vs. prevention and policy. Addict Behav1996;21:755–65. Pendergrast M. For God, country and Coca-Cola: the definitive history of the great American soft drink and the company that makes it. New York: Basic Books, 2000. Wansink B. Can package size accelerate usage volume? J Mark1996;60:1–14. Lewis MK, Hill AJ. Food advertising on British children’s television: a content analysis and experimental study with 9 year olds. Int J Obes1998;22:206–14. Borzekowski DLG, Robinson TN. The 30-second effect: an experiment revealing the impact of television commercials on food preferences in preschoolers. J Am Diet Assoc2001;101:42–6. WHO. World Health Organisation technical report series, No 916, March 2003. www.who.int/hpr/nutrition/expertconsultationge.htm. Charlton J, Murphy M, eds.The health of adult Britain 1841–1994. Office for National Statistics. London: Stationery Office, 1997.
WHO. World Health Organisation technical report series, No 797. Diet, nutrition and the prevention of chronic diseases. Geneva: WHO, 1990. Office for National Statistics. Living in Britain: Results from the General Household Survey, 1998. London: ONS, 2000. MsArdle WD, Katch FI, Katch VL. Exercise physiology: energy, nutrition and human performance. 4th ed. Baltimore: Williams & Wilkins, 1996. French SA, Story M, Jeffery R. Environmental influences on eating and physical activity. Annu Rev Public Health2001;22:309–35. Hill JO, Peters JC. Environmental contributions to the obesity epidemic. Science1998;280:1371–3. Crawford D. Population strategies to prevent obesity [editorial]. BMJ2002;325:728–9. Mindell J. Lessons from tobacco control for advocates of healthy transport. J Public Health Med2001;23:91–7. Bray GA, Macdiarmid JL. Obesity: a global risk factor for disease? In: Guy Grand B, Ailhaud G, eds. Progress in obesity research. London: Libbey & Co, 1999. Chapman S. The ethics of tobacco advertising and advertising bans. Br Med Bull1996;52:121–31. Beverage WH. British food control. London: Humphrey Milford, Oxford University Press, 1928. Hammond RJ. Food. History of the Second World War: United Kingdom civil series. London: HMSO, 1951. Office for National Statistics. Expenditure and food survey. London: Department for Environment, Food and Rural Affairs, 2001. Possible solutions that have political implications are never popular, but that does not mean that they should not be aired. This is particularly appropriate for major problems such as obesity where the food supply plays a major role. Those who make suggestions favouring regulations are often intimidated by the public furore initiated by those adversely affected. But will anything less than regulations work? We can learn from the example of tobacco. Warning people of the dangers of smoking had little effect on cigarette consumption, but regulations on advertising and legislated restrictions on where people could smoke reduced smoking incidence dramatically. We have tried asking people to eat fewer foods of poor nutritional value, but when these foods are advertised and promoted so widely, our poorly funded entreaties have had little effect. It is time to discuss regulation.